LONDON -- The McGuinty government is supporting victims through the Partner Assault Response program by ensuring that roughly 400 additional domestic violence offenders receive group counselling this year. Attorney General Chris Bentley, accompanied by London-Fanshawe MPP Khalil Ramal, announced the additional funding at Changing Ways in London. "The McGuinty government supports this program, that both helps victims and provides counselling and education for abusers," said Bentley. "We are pleased to work with excellent community agencies, such as Changing Ways, to help make sure that people who have abused their partners are held accountable and that women and children can live free of fear and violence in their homes." "The Partner Assault Response program benefits our whole community by helping to prevent violence against women," said Ramal. Changing Ways is receiving an additional $48,965. "The additional funding this year will help us meet increasing service demands to hold abusers accountable, help prevent women abuse from happening and ensure more victims get the support they need when they need it," said Changing Ways Executive Director Tim Kelly. "This investment affirms our government's continuing commitment to ensure women live free from violence," said Deb Matthews, Minister of Children and Youth Services, Minister Responsible for Women's Issues and MPP for London North Centre. "By enhancing victim safety the Partner Assault Response program makes our communities stronger and safer." This document was published on January 25, 2008 and is provided for archival and research purposes. 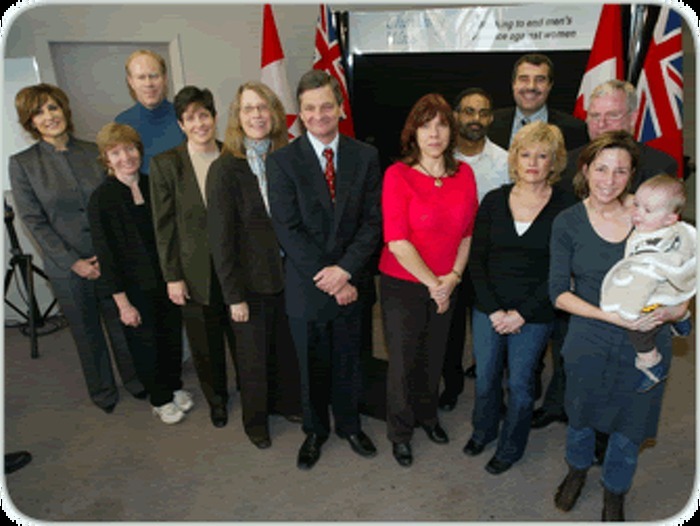 Attorney General Chris Bentley (center) and Khalil Ramal, MPP, London-Fanshawe (top second from right) with staff of Changing Ways at a funding announcement for the Partner Assault Response program at Changing Ways in London.